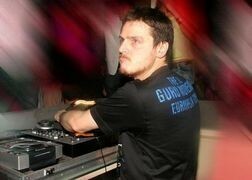 Gianluca Motta is a 32 years old DJ, born under the sign of the Taurus. As he enters the club, like a bull enters the arena, raw power and pure energy starts flowing in the air, like warm breath from the beasts nostrils! But where did all this start In the beginning of the 90s he starts shaping his taste and technique, djing at Mazoom, a club that represents a pillar in the Italian house scene. Here he comes in touch with personalities such as Timo Maas, Lil Louis, Kevorkian, Tony Humphries, Morillo and many others. During the four years he spends at Mazoom he develops his own unmistakable style, unforeseeable, original and dynamic. His sound consists of a powerful blend of his favourite musical scents, discomusic and electronica, wisely mixed together in a tasty sound cocktail. Nowadays his music can be heard in the most famous Italian clubs (Villa delle Rose in Riccione, Paradiso in Rimini, etc). Motta is also well known as a Producer and Remixer, beside being part of the Minimal Chic project.